“The capital of Canada is C.” If you only remember Bud Cort for his quirky roles in Brewster McCloud (1970) and Harold and Maude (1971), you’re in for a real treat with Why Shoot the Teacher?, in which I believe Cort gives one of his finest performances. In this extremely low-key Canadian comedy-drama, Cort portrays “Max Brown,” an awkward young teacher straight out of college who accepts the teaching position from hell at a remote, one-room schoolhouse in the bleak, desolate fictional town of “Willowgreen,” Saskatchewan, during the Great Depression. A total outsider who lives in the basement of the school during the harsh winter and receives promissory notes instead of paychecks, Cort slowly learns to adapt to the eccentric ways of the locals, starts to make connections with the rather rebellious students and also sparks up a relationship with Alice Field (Samantha Eggar), the lonely wife of a farmer. As you can imagine, not much happens but with a slice-of-life film like this it’s all about the journey, not the destination. Definitely not for all tastes! 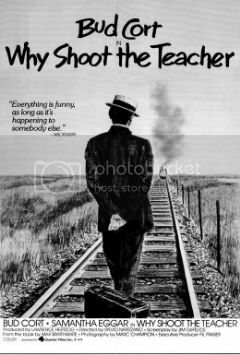 Directed by Silvio Narizzano (Georgy Girl) and based on a 1965 book of the same name by Max Braithwaite, Why Shoot the Teacher? was reportedly filmed on location in Hanna, Alberta. Useless Trivia: Cort reportedly turned down the role of “Billy Bibbit” in One Flew Over the Cuckoo’s Nest (1975) that eventually went to Brad Dourif.